In my journey to becoming one of the best female figure athletes in the world, I knew I needed guidance. With so many personal trainers out there, I wanted someone that knew how to train a champion and not just train someone to lose weight or change their shape a little. I loved training at Enterprise Fitness, my trainer was sensational and achieving the results I did wouldn’t have been possible if it weren’t for his knowledge, guidance and support. Thank you Enterprise, highly recommended, best trainers in Melbourne! 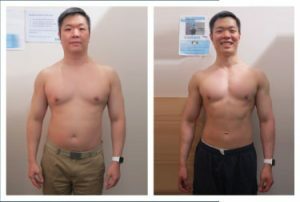 Mark is the real deal… I would say through my experience he is the best personal trainer in Melbourne…. Maybe even the country. If you want to be the best you must train with the best. ANDREW TROMBETTA - "IT'S NOW A WAY OF LIFE"
I set out to reduce my body fat and lead a healthier lifestyle. I believe I achieved this and pushed barriers mentally to get to where I wanted to be. In the relatively short time that I have spent with Enterprise so far my knowledge in training, nutrition and understanding of the body has become far more advanced. I have also learnt some lessons about overcoming challenges that I will carry with me for years to come. TENILLE LEAHY - "MUM OF 3 WINS FIRST FIGURE COMP"
I saw changes in my body immediately after joining! Sometimes it was more of a gradual process, but this was the best way for me to make it a lifestyle and long term. My coach at the time, was fully aware of my goals, my history and catered to these. I set myself the goal of competing and decided to make my first comp the ICN All Female Classic. With only about 7-8 weeks of prep to go, I began training with my new coach. I was given amazing support, information, guidance and the skills to bring a physique I never thought was possible to the stage. MARC ROVERE - "ENTERPRISE HELPED ME OVERCOME A 10-YEAR SHOULDER INJURY!" For the first time ever, I saw progress with my 10-year shoulder injury. Pain decreased, strength went up, self-confidence lifted and before I knew it my whole-body composition started to change. It was all coming together! I've learnt is that there is always a way, and Enterprise will find a way. Thank you to the Enterprise crew for the supportive environment and energy you create. HELEN DU - "I'M EXTREMELY GRATEFUL FOR FINDING ENTERPRISE, IT'S LIKE A FAMILY HERE"
Thanks to Tyler who always supports me and gets my back so that I do not give up so easily.. Thanks to Mark who has created such a welcoming environment so that I don’t feel like going to the gym is a scary thing. I’m extremely grateful for finding Enterprise! I started at 81kg and I dropped 10kg within 4 weeks, while keeping my muscle. I walked on stage at 65 kg. Mark and the guys at enterprise fitness didn’t just help me achieve my goals. They set me up with the much needed knowledge in my training. JADE HALLIDAY - "ENTERPRISE IS WHERE TRAINERS SHOULD TRAIN"
Coming to Enterprise Fitness, I knew that I would be given the resources to train hard and train right. That’s because I was given guidance from a coach that designed a tailored exercise and nutrition program specifically for ME. JOHN FURFARO - "FOLLOWING THE ENTERPRISE SYSTEM, I KNOW THAT RESULTS WILL COME"
Enterprise has helped tremendously in doing all the complicated thinking and planning for me, and then stripping them down into simple and easy instructions that I can stick to according to my goals and lifestyle. Previously, I was focused on the destination of trying to look a certain way. But now, I’m more patient and put a lot of trust into Reece’s programming. As long as I get my training, nutrition and rest right, I know that the results will come. TANIA ROMPANTE - "I LOST 11KGS AND I ONLY SIGNED UP 10 WEEKS AGO..."
He took care of my nutrition, exercise program and was there for me 200% as a support and confidante. I can’t believe the amount of knowledge he was able keep stored in his brain, and I kept on learning and soaking it up like a sponge. He had also competed himself so he completely understood the process and how it can mess with your mind. Never once did he put any doubt in mind that we couldn’t do this – and we were only 10 weeks out from my first comp at this stage! DAVID BRIMACOMBE - "I'VE THROWN AWAY MY MEDICATION AND ALMOST CORRECTED A LIFELONG BACK PROBLEM"
Following my 6 month’s review I must thank you for a job incredibly well done. This has been a time of great adjustment for me (on many levels) and I’ve found myself undergoing a huge lifestyle & health transformation. During this short time I have thrown away medication I’d been on for 20+ yrs and almost totally corrected a life-long back problem (scoliosis). I have also reached many of the targets set for me from day 1 that quite frankly I simply struggled to believe, with the others very close as well. This has only inspired me to go much further! TEAGAN EDWARDS - "I GOT RESULTS I COULD NEVER DREAM OF"
Particularly in the last 5 weeks I questioned myself and ability, however, the EF crew all reassured me of my capabilities and kept me on track with motivation and their endless support. Comp day affirmed all of this for me, where everything came together and my confidence in myself finally boomed. DAT DO - "I LOST I lost 11% BODYFAT, AND PUMPED OUT 20 PISTOL SQUATS FOR A NEW PERSONAL BEST!" 11 Weeks in since starting at Enterprise, I lost 11% bodyfat, dropped 10cm off my waist, my max on chins went from 4 to 14, 80kg for two on the front squat without having done them for years and I managed to pump out 20 pistol squats for new personal bests! Most people just do what they already know which leads to average results. Some people do their research to look for the results they are looking for but it's too easy to be confused with all the information out there. For the achievers that want the straight road to extroadinary results, I'd recommend these guys anyday. NADINE HOSE - "AFTER HAVING MY SECOND CHILD, LITTLE DID I KNOW WHAT WAS ABOUT TO UNFOLD..."
AARON LUXMOORE - "THANK YOU ENTERPRISE FOR HELPING ME GET BACK MY CONFIDENCE"
It’s the first time I have been really shown how to do a program with the right technique, which means I’m injury free for the first time that I can remember! Possibly most importantly, at Enterprise, the nutrition support you get is equally as valued. We sit down together and go through a meal plan (that we are constantly revising after regular measurements) and this has changed the way I think about food. It’s all extremely thorough and scientific. After a photo shoot, I wondered (again) about doing a Competition. I felt it was beyond me because I was over 50 and only girls that looked like models would enter these competitions.I decided to enter one, to enjoy the experience and commit to give it my very best. There was no question that I’d choose Enterprise Fitness to guide me through my quest. So the journey began.